If running out of room to store your data is a concern for you, know that Western Digital aims to make that a thing of the past with its new My Book Studio Edition II. This dual-drive storage system can be configured with capacities up to an enormous 6TB, ideal for those who need to work with high-quality files, such as HD video and photos. You’ll be able to transfer those files at speed as well, thanks to the built-in eSATA and FireWire 800 ports—there’s also a USB 2.0 port and an included FireWire-800-to-400 adapter for compatibility with a wide range of systems. The drive can also be set up as either a striped or mirrored RAID, depending on your needs. You can pick up the My Book Studio Edition II in three different capacities: 2TB ($250), 4TB ($460), and 6TB ($550). All are formatted for Mac and compatible with Apple’s Time Machine backup software. You’ll need to be running at least Mac OS X 10.5.2 or greater or Mac OS X 10.6 or greater to use the 4TB and 6TB models (they also require Windows Vista and Windows 7, if you’re going the PC route). 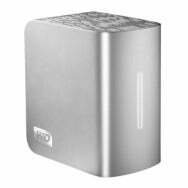 The 2TB model is also compatible with Mac OS X 10.4 and Windows 2000/XP.